Order a copy of my book for yourself and your friends. This emotionally intimate and empowering book will help you feel understood and validated as a gifted highly sensitive introvert. In fact, you’ll feel celebrated! That’s one of the greatest gifts of this book. With expert guidance, you’ll learn to skillfully manage your challenges and feel whole way down deep in your soul. Get access to four FREE bonuses. 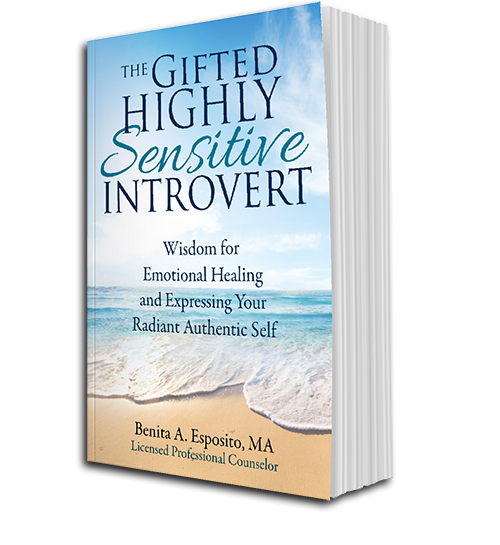 Order The Gifted Highly Sensitive Introvert and get free access to the bonuses! A witty overview to see how far you’ve come … how far you have to go … and how to get from here to there … on your Hero’s Journey. 2. Copy your receipt or order/confirmation number and come back to this page to fill in your number in Step 3. 3. Submit the form below to receive your FREE bonuses.